August can be a misunderstood month. 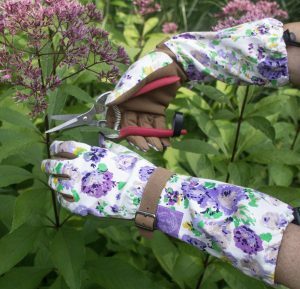 As gardeners we put our energy into fighting back weeds and thinking about next year’s garden, and often miss the rich variety of flowering plants that the late season has to offer. Garden centers will tell you that most people shop for plants in the spring, and they reach for the plants that are blooming, passing over late season bloomers. That may help explain why so many of these plants are less used in our gardens. Vernonia: A genus with many species, this is without hesitation the favorite of Julia and Duncan Brine of GardenLarge, a design firm in Pawling, NY. 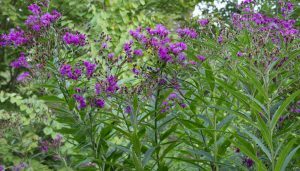 Some Vernonia are towering and some are short, but they have an intense purple flower that contrasts vividly with other late summer colors. They like moist soil but adapt well to dry areas, and they reseed themselves. 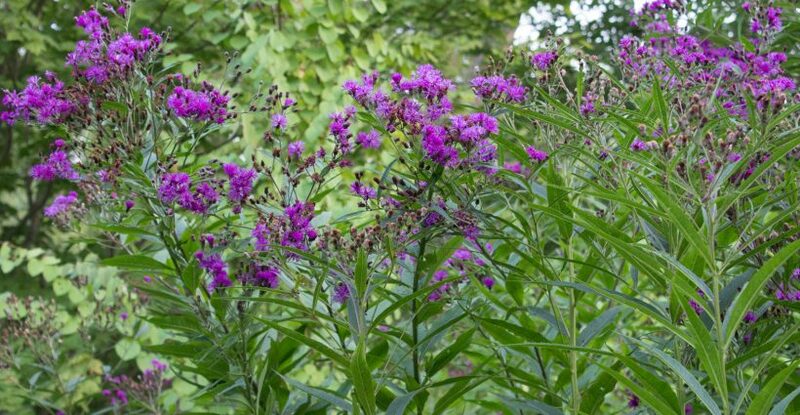 Their common name is Ironweed, and they are also deer resistant. 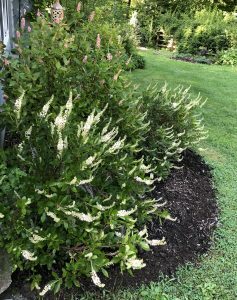 Clethra alnifolia, one of my favorite shrubs, is on Pete Muroski, owner of a garden center specializing in native plants’, list. The fragrant Clethra has white or pink torchlike blooms, and tends to be more compact than most shrubs, ranging in size at maturity from 3′ to (less commonly) 7′, depending on the variety. It’s flexible too, thriving in either wet or dry soil in part sun or part shade. The common name is Sweet pepperbush or Summersweet. 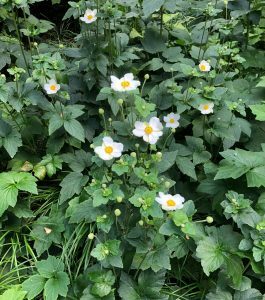 Japanese anemone is on DeeDee Waruch’s list. She’s owner of our local Claire’s Garden Center. It’s a delicate, late summer blooming perennial and can continue blooming for 6-8 weeks, adding a splash of color in white and shades of pink to the late summer garden. 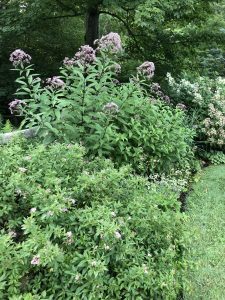 Joe Pye Weed is at the top of Ruth Clausen’s list. Ruth is author of “50 Beautiful Deer Resistant Plants” (Timber Press) and is also a founding member of the fledgling Delaware Botanic Garden. She mentioned there is a brand new variety called ‘Joe White’ that is about 7-8’ tall and has white flowers. It’s hard to find now, but will be available in the future. For now, the tried and true Joe Pye Weed is a great addition to the August garden. Lobelia or cardinal flower is a favorite of Kathy and Stan Scherer, whose Pawling garden is open to the public once a year as part of the Open Days program of The Garden Conservancy. It’s a native and self seeds, so there’s lots of it around and it’s not fussy. Dahlias, which grow on tubers that, in our climate, need to be dug up and stored in the winter, add a charge to Kathy’s late summer landscape too. For a yellow flower she loves her Helianthus, commonly known as sunflower, available in both annual and perennial varieties. Caryopteris is a compact shrub with silvery leaves and blue blossoms that attracts butterflies and bees. It’s a favorite in my August garden! 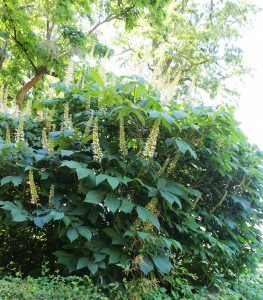 So is Aesculus parvifola, commonly known as Bottlebrush buckeye. I planted cuttings from the Scherer’s garden last year and they’re blooming this year! GardenLarge: Eurybia Macrophylla (Big-Leaved Aster), Solidago Caesia (Wreath Goldenrod), Veronicastrum Virginicum “Fascination” (Culvers Root), Heptacodium Miconioides (Seven Sons Plant). Native Landscapes of Pawling, NY: Favorite Native Shrubs: Potentilla, hibiscus, hydrangea, and the underused baccharis. Among perennials he recommends: phlox, helenium, lobelia, verbena, aster, asclepias, rudbeckia, chelone, helianthus and agastache. Claire’s Garden Center, Patterson, NY: Crepe myrtle, echinacea, ligularia, rudbeckia, Montauk daisy, Hydrangea ‘Limelight’, perennial grasses (Zebra, calamgrastus, all Pennesetum grasses). Ruth Clausen: Allium tuberosa (garlic chives), Blue Mist flower, hardy ageratum, Ajania pacifica ‘Silver and gold’, hydrangea ‘Little Lime’, Sedum Matrone, Perovska Russian Sage.